Two bakers north of New York City are trying to establish a new world record with a 7-foot-long cannoli. Giulio Pistolesi and Scott Wilkinson fried the shell for the 123-pound pastry Friday in a parking lot outside the Cake Bin bakery in the town of Newburgh. Wilkinson says Guinness World Records didn't have a previous record for biggest cannoli, but told the pair they would consider an entry if it came it at over 110 pounds. The organization hasn't yet decided whether to include the entry in their records list. 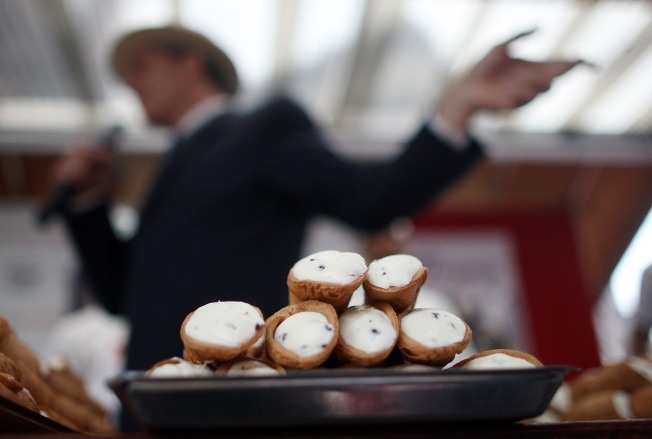 Pastry lovers were invited to taste the cannoli at a fair in New Windsor on Saturday.